The Mectizan® Donation Program (MDP) provided ivermectin for mass drug administration (MDA) in 33 countries in 2018, including 8 countries that launched accelerated LF elimination programs with IDA (also known as triple therapy) with ivermectin, DEC, and albendazole. With the expansion of MDP by providing Mectizan for triple therapy to eliminate LF, another 36 countries may be eligible to receive the drug. 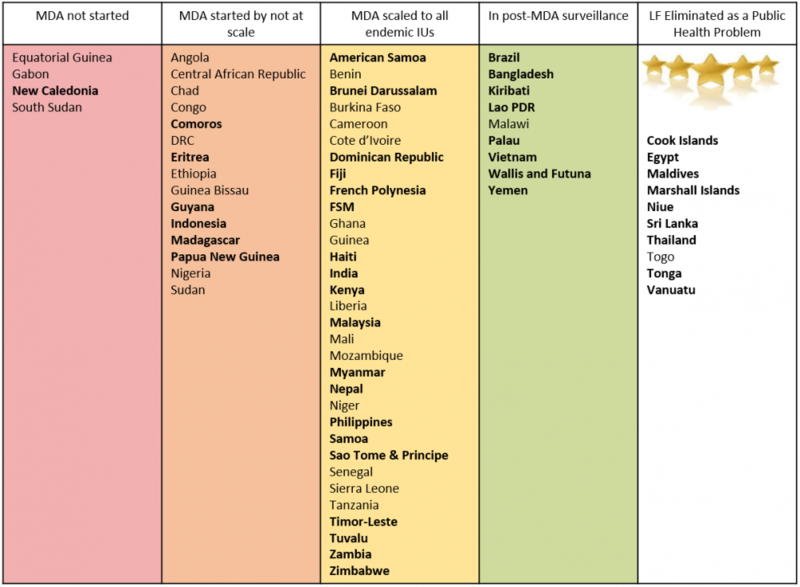 *Countries in bold are countries that may be eligible to receive Mectizan as part of triple therapy to eliminate LF.